To grow, we all, especially SMEs can grow only if we embrace AI completely. For, only then we can be relevant in the new digital world. Today, AI can enable breakthroughs for SMEs across many departments. Though AI has just come into the world, it has grown so rapidly that it will change the way businesses are managed through the level of technology it provides. All those who have begun implementing AI into their business workflow and are seeing a considerable improvement in ROI and business turnover. Many however this this is applicable only for big businesses. They think it requires a lot of investment of funds and expertise. This is completely not correct. AI has actually made the system very democratic. The amount of money people need to spend on digital marketing is much lesser than traditional marketing. However, because of its longevity, people are accustomed to traditional marketing. We are used to seeing ads in magazines and newspapers, or reading billboards. The fact is, most of the time, traditional marketing is reaching only a local audience. Even this audience is not fully captured. In traditional marketing is that the results are not easily measured, and in many cases cannot be measured at all. It is also much more expensive than digital marketing. Further, it is completely static and there is no way one can interact with the audience. One just keeps hoping that they decide to take action. A primary benefit to using digital marketing is that the results are much easier to measure. Another very important benefit is that the campaign can reach even a global audience. It is also possible to customise a digital campaign to reach a local audience. It is truly a win win situation. Interaction in digital marketing is and reaching an audience is also doable since it makes use of social outlets. Further, the business can get some very valuable consumer feedback easily. One of the primary disadvantages to using digital media marketing strategies is that it can take some time to realize measurable success. Still, we must move on. The world has now moved into a very digital environment. Not only are magazines going digital, many of us perform many of our daily tasks such as banking online and much of our reading is done on e-readers. Due to the rise of the digital age, it just seems like common sense to invest in a digital campaign. Even though traditional marketing still has a place, we need to learn digital marketing soon. For in today’s businesses, it is imperative to have a website and use the web as a means to interact with their consumer base. There are some successful traditional marketing strategies, but it is important to take advantage of digital marketing so as to keep oneself updated in today’s world. Contrary to what many people think, AI can be useful for small companies also. This is because it allows correct use of the data they generate. Due to this, we feel everyone should start thinking about the steps which can allow them to implement AI no matter the size of their business successfully. It is import to nurture our customers. Very often, businesses fail to give proper support due to human errors. Through AI enabled support services, this would never happen. Further, the risk of human error would be wholly eradicated. Studying the competition thoroughly is critical for all businesses. It helps us in understanding market trends and staying competitive. AI helps by providing significant and relevant insights into the business process of one’s competitors. For instance, there a AI-powered competitive analysis tool called Crayon. It helps track competitor’s activities across different channels like websites, social media, and web applications. This helps small businesses to get a better understanding of ongoing changes in the competitor’s strategy. Small enterprises can easily deploy off the shelf tools into all elements of their business workflow involving data. These solutions provide not only better insights into the process, but also suggest better solutions for the problem. For instance, AI enabled tools like Monkey Learn uses technologies like entity extraction and sentiment analysis to derive a better understanding of the business. This is extremely easy to integrate. Another tool worth exploring is the Enterprise Immune System by Darktrace. This helps companies build their own understanding of what normal human behaviour looks like within an enterprise and detects emerging threats in real time. AI is fundamentally changing marketing from the roots. AI-based advertising platforms have already been deployed by huge companies like Facebook and Google to target specific customer-set who are receptive to their message. This approach is equally applicable for small businesses. By using programmatic advertising, everyone can easily reach a considerably large audience online, which was not possible earlier. 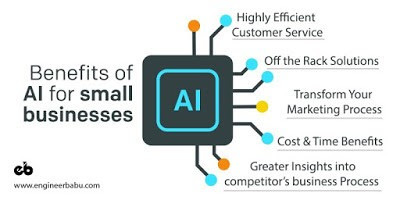 It is strongly recommended for small businesses to start leveraging and integrating AI now if they want to reach potential consumers in the future. The utilization of deep learning by SMEs can end up saving a lot of money spent on employing extra employees or outsourcing for specified projects. Time-consuming work is done quickly and efficiently at the push of a button. This allows employees to be freed up to do creative work that will help the company grow. AI is not restricted to large enterprises now. It is an excellent way to achieve tremendous growth for SMEs as well. They help SMEs to effectively delegate conventional tasks to be done by an innovative yet fast approach, making employees free to focus on other resourceful and creative opportunities that can help companies expand. In the 80s, there were exceptions and some businesses considered investment in computers for the future of their industry. These were the ones who grew. The situation regarding implementation of AI is very similar to the above situation. need to align applications with their business goals. Essentially, the AI journey can be prolific for SMEs. They of course need to understand the significance of this emerging phenomenon. After this, they could accordingly prioritize it to achieve long-term and scalable success. Don't wait. Learn to use AI and digital marketing for success.